Circular, dsDNA genome of about 368kb that encodes potentially for 457 ORFs. NUCLEO-CYTOPLASMIC Replication cycle lasts 5 hours ex-vivo. 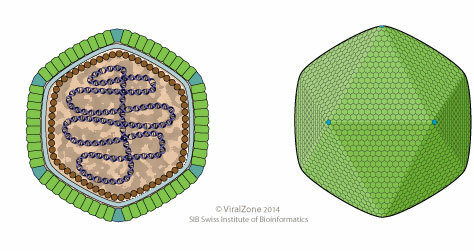 Fusion of viral envelope with cellular membrane, inducing the release of viral DNA into host cytoplasm. Host cell nucleus shrinks, indicating possible degradation of host chromosomes. ETYMOLOGY Marseille: from the french city of Marseille, referring to the location of laboratory that first isolated the virus. GEOGRAPHY Marseillevirus was isolated in France, Lausannevirus in Switzerland.